Michiyo's painting and her advice is featured! What do I do at this Creative Doodling class? This is for everyone who needs some kind of creative outlet but don't want to commit long term school program. Study shows having at least two hours a week of creative activity makes you feel positive and less stressed. ​This is NOT a class to learn how to paint trees or people. It is to guide you how to connect your inner guidance. Be mindful, be calm, let your creativity flow through you! Materials (watercolor) are provided but you are welcome to bring your prefered medium that works with paper (colored pencil, color markers). *Please note the studio doesn't have windows so no sprays or oil paints. I have no art background and I can only draw stick figure.... can I take this class? Yes, it is for all levels and Michiyo will guide you every step while you are exploring what's in your mind/heart! Interested? Let's book your spot online! Not getting enough instruction at big art school? We offer individual guidance so everyone get what they need! Regular lesson is provided one on one basis and every levels are welcome. Just pick your convenient sessions and pay as you go. Flexible scheduling for busy New Yorkers! 24 hour cancellation policy applies. Click for Lesson schedules and booking your session! Beginners are welcome! Do you have questions? Check FQA first! Scroll down for price options. Bring your own materials and project! Anything you want to paint, Michiyo will walk you through with individual guidance! In general, the process of watercolor painting requires under drawing and building image with layers and layers of colors so it will take more than 2 hours to finish (average of 6-8 classes to finish) one painting but it will exceed your expectation! If you are attending for the first time, consult with Michiyo before you take this class. Take the intro and learn what watercolor is about! New students (first time or second time) are encouraged to take this lessons. (One time materials are available for $3 for new students but you are welcome to bring your own) Paint and bring beautiful painting home after the lesson! Once (or twice) you take this class, you will have some idea what you want to paint! Have all your materials ready and let's get started! Drawing is essential/fundamental to any medium. Learn and develop your eyes to see values, shapes and depth. Students will work from still life. Who is teaching? Meet our instructors! Buzz 034 + call for B9 studio, take the elevator to the basement, studio is all the way back of the hallway. Please read following booking policy! You can book your session from "Schedule/Booking" page. Creating your account and prepay is required to book. *You can cancel/modify your appointment 24 hour prior to your session. One credit will be returned if the absence is notified before the class begins. No shows won't receive any credit back. After you booked your session, you will get confirmation email and a link to modify your schedule. You may contact us directly for the last minutes attendance IF there is another student booked the session and there is opening. Call (646) 389-6447 and leave voice message or send texts. *Lesson fee does NOT include materials. Bring your own or check supply list and have them ready for the lessons. You may purchase one time materials to use for $3 at the lesson. *To buy credits for your lesson you need to create an account on the booking site. Not sure about your schedule? *Credits expires in 6 month from the date of purchase, no bookings beyond the expiration date. *Must complete 10 classes within 6 month from the day of purchase, no bookings beyond the expiration date. Credits are not shareable. You may invite one person once using your credit but no more than one time. Good for busy New Yorker! For some special events or to make up for your lost credit due to cancellation made after 24-hour limit. *Regular class requires 2 credits. If you don't have anything but want to try the class, we provide one class materials. It includes everything you would need to use during the class and a professional grade paper to take home with your finished image! Michiyo Fukushima is teaching at her TriBeca Studio and at the New York Academy of Art regularly and at the Art Student League as a guest instructor. Requests for private lessons are accepted. Contact for schedule and rate. 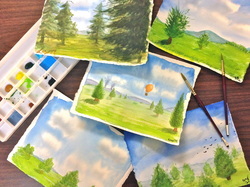 Michyo Art Studio offers watercolor classes and drawing classes, aiming to inspire and encourage for people who always wanted to paint but hadn't had opportunity. Unlike big art school, students will receive more personal attention and classes are led by one on one basis.